Planning and Zoning Comission Chairman Laszlo Papp and member Elizabeth DeLuca at a meeting Tuesday, April 29, 2014, at the New Canaan Nature Center, in New Canaan, Conn. 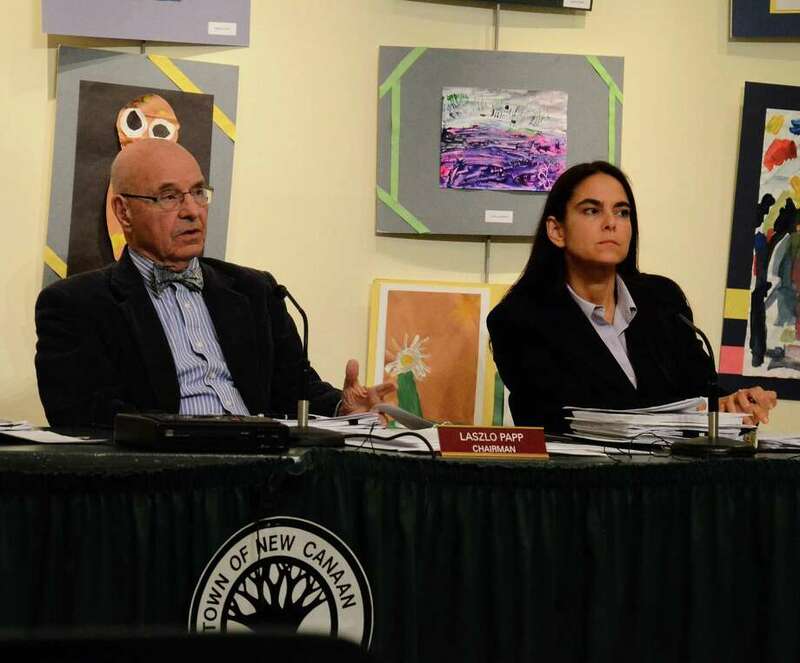 Despite imposing more than 30 conditions, New Canaan's Planning and Zoning Commission unanimously approved the YMCA renovation project Tuesday night. With the approval, the YMCA will be allowed to use Putnam Road for construction access. "The commission finds that the neighbors who oppose the application did not provide evidence from a qualified traffic expert that the Putnam Road access point was not the safest (alternative)," the approved resolution states. However, access to the facility from Putnam Road only will be allowed for heavy construction vehicles. In addition, such traffic would be restricted to 8:30 a.m. to 2 p.m. and after 3:30 p.m. to avoid coinciding with children walking to and from the schools. In addition, the Y will be required to employ traffic monitors at the Putnam Road construction entrance and at the intersection of South Avenue and Surrey Road -- the later connects Putnam with South Avenue. The project aims to renovate the rear half of the building, replace both swimming pools and locker rooms, and upgrade the gyms and wellness areas. YMCA officials asked to set up a construction entrance on Putnam Road because they said it would provide direct access to the rear of the facility, where the construction will take place, and avoid crossing the front parking lot where they say there is a lot of traffic. Experts also have said it would not be safe to have trucks crossing the gas pipeline, which runs at an angle underneath the property. Area residents, however, have opposed the proposed Putnam Road access, claiming construction trucks would make the neighborhood unsafe for children. The YMCA is located at 564 South Ave. -- next to Saxe Middle School. Putnam Road is located right behind the rear of the facility. Children who live in that neighborhood, according to the residents, are not eligible to take the school bus because of the short distance so many of them walk to school. New Canaan YMCA spokesman George Russell said the organization is "very pleased" with the decision. "We intend to fully comply with the P&Z's conditions," Russell said Wednesday. "In studying these conditions, we believe they're all reasonable. In fact, many of these conditions are actions that we would take independently anyway." Michael Dorfsman, an outspoken Putnam Road resident, said Wednesday that he and other neighbors were still reviewing the approved resolution and conditions, but added that the limitations would provide "very minimal protection" to the children in the area. He said there would be many children playing, running and riding bikes in the area during summertime. "What happens in July and August?" he said. One of the 33 conditions imposed with the approval of the project is that YMCA officials must ask the Board of Education to allow them to make a temporary construction road along the south end of the Saxe Middle School field. If approved, the road would be used for construction access, replacing the Putnam Road option. The Board of Education informally rejected the idea in February and Y officials themselves have said there would be even more pedestrians and children in that construction path. Commission member John Goodwin said the Board of Education should reconsider because the YMCA is "an extension of the school system." He noted that the schools' swimming teams use the Y's pools to practice. "The YMCA is just a part of this town as the schools are part of this town," Goodwin said. Dorfsman said the path through the school would be the best solution. "Coming through Saxe would be a much safer alternative, especially because you take the gas pipeline out of the equation," he said. "The Y remains quite comfortable with Saxe access if that is an option," he said. "While it would be more expensive for the YMCA, we believe we can make that work." Planning and Zoning wants the YMCA to request a formal response from the Board of Education within 60 days. The commission also decided to allow the Y to install only 20 additional parking spaces. The organization had requested 68 additional ones. The main purpose of the renovation, according to YMCA officials, is to replace deteriorating infrastructure. The facility's locker rooms, which have never been renovated, would be more accessible for people with special needs. YMCA officials hope to begin the project this year but a breaking ground date still is to be determined.